AN ABT SYSTEM rack railway locomotive built by the Swiss Locomotive Company, Winterthur, for the Nilgiri branch of the South Indian Railway. The cylinders driving the axles operating the rack pinion axle can be seen above the adhesion engine with its long connecting rod. THE hill railways of India are numerous, widely scattered and varying in character. India is a sub-continent larger than the whole of Europe less Scandinavia and Russia. It is bounded on the north by that greatest of mountain ranges, the Himalayas. The spurs of the Himalayas are hundreds, and in some instances thousands, of miles long. There are, besides, notable detached ranges such as the Nilgiris in southern India, and the Western Ghats overlooking the west coast. More-over, the tropical climate of a land in which there are many people who come from more temperate climates is responsible for driving them to the welcome coolness of the hills in the hot weather. Hence the need for railways to carry them to the hills. Occasionally, however, the trade of the country has also to be transported over the mountain ranges. It is difficult to define a hill railway, and still more difficult to describe all those that might claim this title; but this chapter will give readers a general idea of the various types of hill railway in India. Classification may best be based first upon gauge and then upon geographical or traffic conditions. The hill lines are built to four gauges: broad (5 ft 6-in), metre (3 ft 3⅜-in), 2 ft 6-in, and 2 ft. The term “ghat”, which frequently recurs in this chapter, means a hill, hill range, route through hills, or a pass. The mountain lines given in the table on this page are of particular interest. T he Darjeeling-Himalayan Railway is described in the chapter beginning on page 691. The others are dealt with here. The Thal and Bhore Ghat inclines have to be negotiated by two out of the three main lines radiating from Bombay, where they scale the Western Ghats - that steep and rugged escarpment in which the central Indian plateau ends abruptly towards the west coast. The Thal Ghat section carries the whole of the Great Indian Peninsula northeast main line traffic from Bombay. Over it are run all kinds of passenger and goods trains to and from Jhansi, Agra, Delhi, Lahore, and Peshawar; Cawnpore and Lucknow; Allahabad and Calcutta (by the East Indian Railway route); and Nagpur and Calcutta (via the Bengal-Nagpur Railway). The hill section was completed in 1865, and comprised twenty-five miles with a ruling grade of 1 in 100, followed by two miles of 1 in 60, then five and a half miles of 1 in 37, and finally a mile of 1 in 49 to 1 in 100. Its double tracks wind upwards along steep hillsides, across deep ravines - by means of six lofty viaducts from 80 ft to 180 ft high - and through no fewer than thirteen tunnels, with an aggregate length of one and a half miles. Two-thirds of this ascent are curved, and the sharpest curve has a radius of seventeen chains. As originally constructed, there was a reversing station out of which all trains had to back-shunt, but this was eliminated some years ago, and the re-alignment necessitated has slightly modified the foregoing figures. Even the elimination of the reversing station was insufficient to enable this slow-speed section of line to cope successfully with the heavy traffic it had to carry while steam traction was used, and in 1930 the ghat section was converted to electric operation. In common with the Bhore Ghat, it is worked with two types of electric locomotive, a 4-6-2 passenger engine and a 0-6-0 + 0-6-0 goods. The former weighs 102 tons and is rated at 2,160 horse-power. It has six motors, two actuating each driving axle. The driving wheels have a diameter of 5 ft 3-in, and t he adhesion weight is 60 tons. The goods locomotives are used in pairs on the ghat section, each pair being capable of hauling 1,000 tons up the 1 in 37 grades. The maximum permissible downhill load is 1,600 tons. The goods locomotives weigh 120 tons, all of which weight is available for adhesion. Their horse-power is 2,600, and they have two motors on each bogie truck; these drive the coupled wheels through a jack shaft. The 1,500-volts direct current is collected from overhead wires and regenerative braking is arranged. The scenery is rugged and imposing on the Western Ghats. As the train winds in and out round sharp curves, steadily climbing the steep hillside, the atmosphere becomes noticeably fresher. The damp heat of Bombay is soon left behind. ON THE NILGIRl BRANCH of the South Indian Railway. With its 1 in 12½ gradients this is the steepest and only rack-worked line in India or Burma. The rack as well as the excellent standard of construction and maintenance may be noticed. 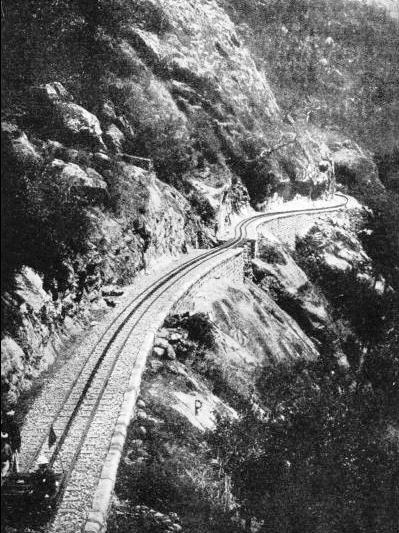 The Bhore Ghat incline, as constructed in the early sixties, was sixteen miles long, rising over 1,800 vertical feet in that distance. There were eleven miles of 1 in 40, followed by about two miles of 1 in 37¾, and finally another two miles of 1 in 40. No fewer than ten and a half miles were curved, and there were twenty-five tunnels, with a total length of two and a half miles, also eight lofty viaducts varying in height up to 160 ft. Except for a realignment to eliminate the reversing station, which somewhat lengthened the route, this incline remains to-day very much as it was then constructed. It is an even more spectacular engineering and scenic length of line than the Thal Ghat incline, and is similarly laid with double track. Traffic over it is not as heavy as on the Thal Ghat, but in spite of its stiff gradients and sharp curvature, it forms part of the route of the fastest train in India, the “Deccan Queen”. This express runs from Poona to Bombay and back daily, a distance of 118 miles in either direction, in 175 minutes. The eighteen miles climb, at 1 in 37¾ to 1 in 40, is allowed only thirty-eight minutes from start to stop. Such an achievement is made simple by the electrification of the complete Bombay-Poona section, which was completed in 1929. These two ghat inclines are the only hill sections in India over which really heavy main line traffic - according to Western standards - is worked. Turning our attention now to the rugged North-West Frontier, with its wild tribesmen and hundreds of miles of barren mountains, we find in the Bolan Pass Line, Baluchistan, another broad-gauge line with even steeper gradients. This mountain railway, forming the Mushkaf-Bolan section of the North-Western Railway, carries a substantial traffic to and from the North-West Frontier Province, the important military centre of Quetta, and Chaman, on the borders of Afghanistan. At the time of writing, Quetta has been devastated by one of the worst earthquakes in the history of India. There is some doubt as to whether this famous military centre will be rebuilt, and this must be borne in mind when any mention is made of Quetta in this chapter. The Mushkaf-Bolan section is the direct route from the plains to Quetta, as opposed to the alternative Sind-Pishin railway, which, however, has easier gradients. Originally built as a metre-gauge line, the Bolan Pass Railway was reconstructed as a broad-gauge section in the ‘nineties. It is eighty-six miles long, and the aggregate rise from Sibi, at the foot of the incline, to Kolpur, the summit before reaching Quetta, is 5,463 vertical feet. This great ascent necessitates long stretches graded at 1 in 25 and 1 in 33 - throughout both of which the line is double - as well as climbs of 1 in 40 and easier gradients. The line, which is steam operated, is solidly built, so that the heaviest engines can run over it. For many years the only Indian broad-gauge “Mallet” compound - having the 2-6-0 + 0-6-2 wheel arrangement - and a heavy 2-6-2 + 2-6-2 Garratt locomotive were used on the Bolan line to supplement the standard superheated “H.G.” class 4-8-0 “maids-of-all-work”. The latter haul the mails, passenger trains, and goods trains indiscriminately, assisted up the 1 in 25 and 1 in 33 lengths by powerful 2-8-2 side tank locomotives weighing some 95½ tons. They have 20-in by 26-in-. cylinders, 4 ft 3-in coupled wheels, a grate area of 30 sq ft and a total heating surface of just over 2,000 sq ft; 70½ tons are available for adhesion and 2,200 gallons of water and 6½ tons of coal are carried. Although the Mushkaf-Bolan section is in Baluchistan, the barren, rocky mountains through which it climbs are typical of “the Frontier”. Sibi, at its foot, is probably the hottest spot in all India, and the shade temperature on the station platform goes up to 130° F. On the other hand, the Quetta district in winter experiences cold down to 15° of frost. The difference in the climate, atmosphere, and temperature as one travels up this wonderful railway is very marked indeed at almost any time of the year. The first line to be constructed to Quetta was the Sind-Pishin, but it is still of a comparatively light standard. The heaviest engines allowed over it are the new Indian standard light 4-6-2 XA’s, which have only 13-ton axle loads. Single throughout, this line is about 120 miles in length. In that distance it mounts over 6,000 vertical feet, with a ruling gradient of 1 in 40-45. Two outstanding engineering features on this route are the Chappar Rift and the Mud Gorge. The former is a deep cleft in the country about three miles long, with vertical cliffs 200 ft to 300 ft in height, which cuts across the ridge separating two valleys. The line uses it to pass from one of the valleys to the other, but this bold policy involves nine tunnels 6,400 ft in aggregate length, a seven-span viaduct and the famous Margaret Louise bridge, which is 250 ft high and consists of one 150 ft and eight 40 ft spans. The Mud Gorge is a very steep narrow valley, five miles long, with most treacherous soil, mostly gypsum, that becomes a sludge and slips down the valley when there is any rain. The only practicable way to control the landslides was to line the gorge with masonry, after some considerable difficulty and at great cost. THE GOKTEIK VIADUCT on the Lashio branch of the Burma Railways carries the line over the Gokteik gorge. At the bottom of the gorge is a river 820 ft below the rail level of the viaduct. The great double trestle in the illustration is 350 ft in height, and is built upon the mouth of a natural arch or tunnel through which the river passes. The viaduct was set out and the foundations built by Indian State Railway engineers, but the steelwork was fabricated and erected by an American firm. Though not on our list of hill railways, the other two lines which radiate from Quetta are of unusual interest. One goes northwards, and after passing through the Khojak Tunnel, the longest in India, reaches the Afghan frontier at Chaman. There is considerable fruit traffic from Khandahar via Chaman to all parts of India at certain times of the year. The other line forms the long tentacle that stretches westwards and for two hundred miles marches with the Afghan frontier until it enters Persia at Mirjawa, and ends at Duzdap. On this line there is a very tortuous descending ghat section to Nushki, the ruling gradient for several miles being 1 in 50. The section of this line from Nok Kundi to Duzdap was, however, closed to traffic some years ago. T he last but not the least of the broad-gauge hill railways is that over the Khyber Pass, which was completed in 1925. Leaving the Plain of Peshawar at Jamrud, this line climbs through some 2,000 vertical feet to the summit of the pass at Landi Kotal, the stiffest part of the climb requiring 1 in 33 grades, and two reversing stations. From Landi Kotal the line descends to Landi Khana on the Afghan frontier. There is a fall of 577 vertical feet in a distance of under a mile as the crow flies, but a track distance of three and a half miles has been “developed” by means of two reversing stations, and a gradient of 1 in 25. But the most interesting “development” is on the 1 in 33 climb from Jamrud. This line, also, is worked by the ubiquitous “H.G.” class 2-8-0 type locomotives. It is less spectacular than some others, but it was very difficult to build. The construction involved thirty-two tunnels in what proved to be most treacherous shale. The work had to be carried out in the face of the wild and lawless Pathan tribesman, who resented the coming of the railway. 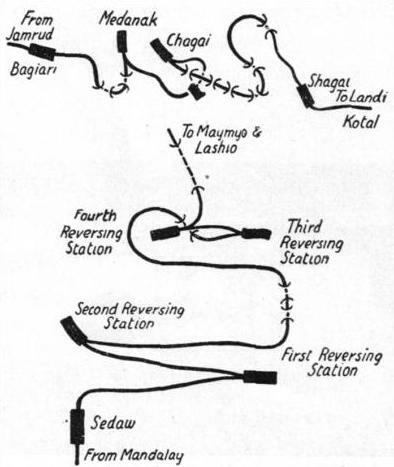 THE RAILWAY OVER THE KHYBER PASS and its twisting route is shown in the top sketch. There are gradients of 1 in 33 near the summit at Landi Kotal. The lower diagram shows a section of the Lashio branch line on the Burma Railways, notable for continuous gradients of 1 in 25 and four reversing stations. The only extremely steep metre-gauge hill railway in the Deccan - the peninsula of India proper - is the Nilgiri branch of the South Indian Railway. It is also the one section of line in India worked on the Swiss Abt rack system. This is necessitated by its long 1 in 12½ gradients. The type of locomotive used is Swiss built. As on similar grades elsewhere, the engine is always below its train whether ascending or descending. The first part of the climb from the plains up to Conoor is mainly along an almost continuously precipitous mountain face, involving rock galleries and tunnels, as well as other heavy engineering works. The views from this part of the ascent over the plains are magnificent. Above Conoor the gradient eases, and no rack is used. Ootakamund, the summer headquarters of the Government of Madras, is reached just beyond the summit of the line, which is 7,300 ft above sea-level. This is one of the most attractive hill stations in India. Most of the others are perched precariously on steep hill slopes, but Ootakamund is situated on a plateau, encircled by open rolling downs. Here English wild flowers abound, and also many that are cultivated at home grow wild there, notably the Arum lily, which in “Ooty” grows in the streams. Altogether it is probably one of the healthiest and most pleasant spots for Europeans in the whole of the East. 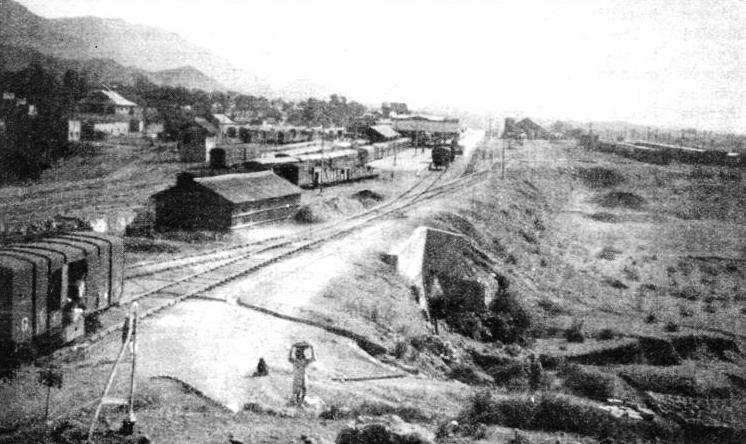 KALKA JUNCTION, the terminus of the broad gauge section of the North Western Railway from Delhi via Ambala, and also of the 2 ft 6-in gauge line onwards to Simla. Kalka Junction is an important passenger and goods transhipment station and has broad and narrow gauge engine sheds and small workshops. The other two mountain grade metre-gauge lines are both in Burma, the whole of the Burma Railways system being of that gauge. The Lashio branch of that system extends from Myohaung Junction outside Mandalay, up into the Northern Shan hills. It serves Maymyo, the Government hill station of Burma, and Namyao, the junction for the Burma (mining) Corporation’s Railway before Lashio, the headquarters of the Northern Shan States, is reached. Its total length is about 170 miles, only the first fifteen of which are in the plains. Then at Sedaw the ascent begins abruptly, and the line rises in three zigzags up the face of an almost precipitous hill spur. The accompanying sketch map shows the principal features of this spectacular line, which involves a complete spiral curve and four reversing stations, with continuous 1 in 25 gradients between them. This alignment is not dissimilar to the Khyber climb constructed thirty years later, though the Khyber grade is easier. The views over the plains as one climbs from Sedaw are splendid indeed. This severe gradient of 1 in 25 extends practically unbroken, except through stations, for nearly thirteen miles. Then 1 in 40 is the ruling gradient for about ninety miles, during the course of which the line rises and falls in several smaller ghats, once the summit of the first is passed near Maymyo at an altitude of 3,800 ft. There are a long descent into and a long ascent from the famous Goteik gorge, which runs athwart the general course of this line, the gorge being a great rift in the limestone formation of the country. Even with 1 in 40 approaches winding down the sides of the gorge, it was not possible for the survey engineers to carry the line below a level of 800 ft above the bottom of the gorge. Luckily, however, nature provided a natural bridge - or tunnel, as it really is - to help to carry the railway across the abyss. For the river at the bottom of the gorge here burrows through the limestone, which thus forms a natural arch. To cross over this the engineers designed a remarkable steel trestle viaduct of American pattern and make. 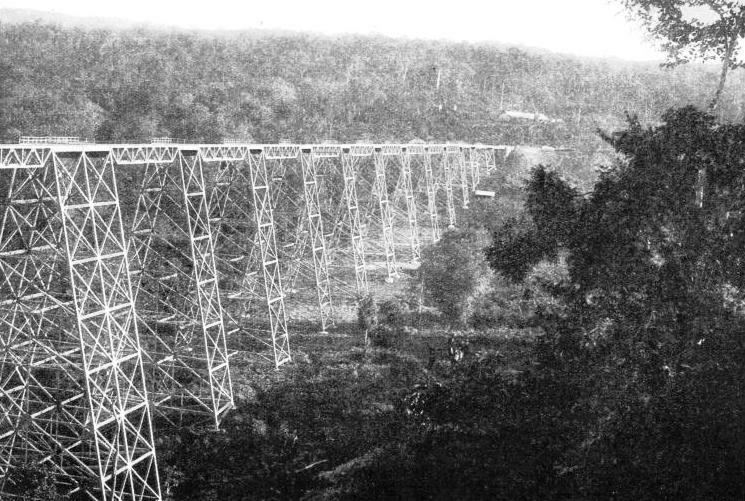 The highest trestle, 350 ft in height, stands immediately above the river on the limestone tunnel. At this point the line is over 800 ft above the river bed, into which it appears possible to pitch a stone from the bridge towering above it. The whole viaduct is about 2,200 ft in length. Immediately beyond it the line reaches the precipitous face of the gorge and, after piercing two outcrops of rock in tunnel, clings precariously to it, as it winds up the farther side of the valley. A WELL-KEPT PERMANENT WAY is maintained on the Kalka-Simla line and, in view of the narrow gauge, the 60 lb rails used are heavy. Rails of this weight are necessary because of the excessive wear that occurs on the sharper curves, some of them - as shown above - being of 120 ft radius. 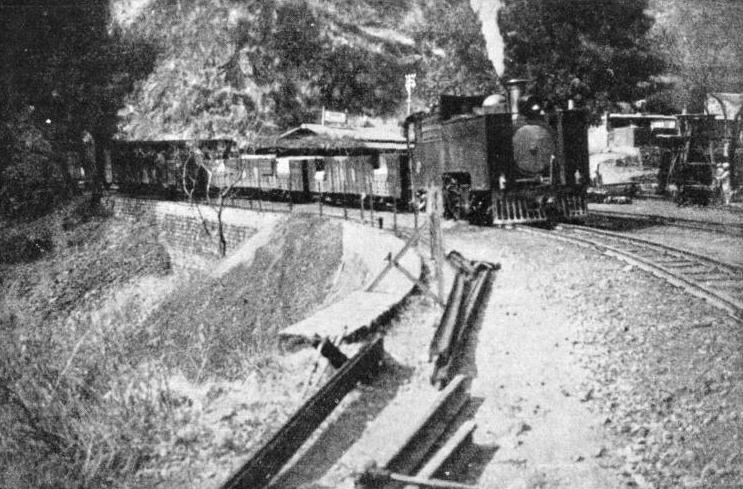 This branch, while carrying a very fair passenger traffic to Maymyo, has the advantage of transporting iron ore, as a flux for the silver-lead smelting works of the Burma Corporation's mines at Namtu, as well as the silver and lead produced. Thus there is a heavy traffic on the 1 in 25 section. Here almost all trains have to be divided, or else provided with pusher engines, which, of course, have to be worked downhill again. Many different types of articulated locomotives have been used at different times on this branch. 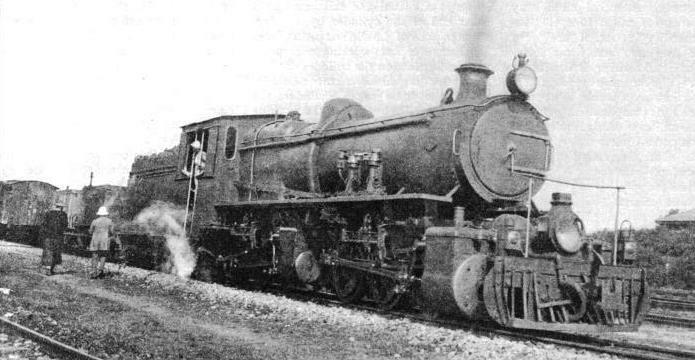 The earliest were 0-4-0 + 0-4-0 Fairlies, brought from the original metre-gauge Bolan line already mentioned. These were soon replaced by 0-6-0 + 0-6-0 engines of the same general type, but much more powerful. They had two boilers and fireboxes back to back with the cab between them, mounted on a fish-bellied girder frame slung between the engine bogies. Weight in working order was 60 tons - 10 tons on each axle. These engines could haul unaided about 110 tons up the 1 in 25 grades, which abound with 330 ft radius reverse curves. About 1906 the Fairlies were reinforced by a number of fine 0-6-0 + 0-6-0 “Mallet” compounds, built by the North British Locomotive Co, Ltd., in Glasgow, which, though they are of the same weight, can easily haul an additional twenty tons up the ghat. These engines dealt with the bulk of the traffic, goods, passenger, and mixed, on this and the Southern Shan States branch - assisted by a sturdy 2-6-2 tank for pushing work - until the introduction of the 2-8-0 + 0-8-2 Beyer-Garratts, about 1924-5. They were at that time the heaviest metre-gauge engines in the world. These fine machines, single-handed, daily haul 200 tons, and have taken 230 tons up the tortuous 1 in 25 section. The “Mallets” now work mostly on the 1 in 40 section beyond Maymyo. The Southern Shan States branch of the Burma Railways, eighty-seven miles long, was constructed shortly before the war of 1914-18. The Shan States, through which this and the Lashio branch run for the greater part of their lengths, are about 300 in number, each with its own Sawbwa or chief. They vary in size much as do the English counties. KOTI, a station on the 2 ft 6-in gauge Kalka-Simla section of the North Western Railway. One of the hundred odd tunnels on this line is straight from end to end. The main climb of the Southern Shan States branch is also at 1 in 25, with four reversing stations and a spiral, or complete loop, but the practically continuous length of the 1 in 25 section is even longer than that just described, namely sixteen miles. There are very heavy engineering works almost throughout the first, or Yinmabin Ghat, and onwards up the main climb to Myndaik - 4,600 ft above sea-level - near Kalaw, where beautiful plateau country is reached. Kalaw, with its pine-clad hills, is another hill station favoured by Europeans. From Kalaw the next twenty miles are undulating. There follows a final steep fall, known as the Heho Ghat, to the terminus near the Inle Lake. The engineering work is again heavy here and involves a second spiral in the course of the 800 ft descent. Taunggyi, the headquarters of the Federation of the Shan States, is not far beyond the terminus, and stands over 5,000 ft above sea-level; here, too, the country is delightful. The traffic on this line is light and is now worked by the Garratt engines already mentioned. The longest of the narrow-gauge hill lines is the Kangra Valley branch of the North Western Railway. It climbs from the Punjab plains up into Mandi hill state. The gauge is 2 ft 6-in, and, though the ruling grade over a part of its length is 1 in 50, it has a final ascent of some miles at 1 in 25. The principal feature of this line is the heavy bridging involved almost through-out; the aggregate length of the steel girder bridges is 11,000 ft. Among other bridges is the first steel arch in India, known as the Reond Arch. It bridges a cleft in the hills 200 ft deep with two 40-ft approach spans and a single main span, with a steel arch, 180 ft long. This arch was made entirely in India. The delicate operation of erection was successfully carried out by the Bridge Department of the North Western Railway. The scenery along this line is most impressive, particularly in winter when the snow-clad Dhaula Dhar mountains appear to be near at hand. As the Kangra Valley was the centre of the disastrous Dharamsala earthquake some years ago, all structures on the line - which was constructed as recently as 1926-28 - are designed to resist shocks as far as possible. The line is worked with powerful 2-8-2 tender locomotives. As with the broad- and metre-gauge lines already described, all vehicles, both passenger and goods, are fitted with continuous (vacuum) brakes. 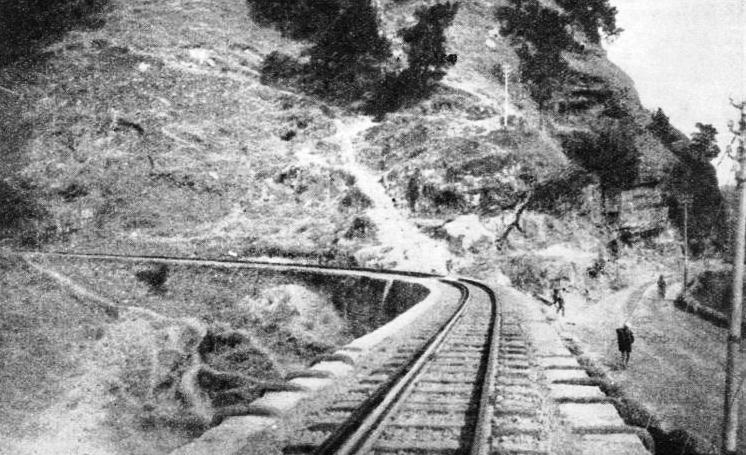 ON THE KALKA-SIMLA line there are loops where the track doubles back upon itself. A passenger train having completed a loop is seen above the line over which it has just passed. One of the many “galleries” or viaducts of multiple tiers of arches is in the foreground. Perhaps the best known and one of the most interesting of the Indian hill lines is the Kalka-Simla Railway. It probably deserves a rather more detailed description than some of those previously dealt with on this page. The Kalka-Simla derives importance from the fact that during the summer months the Supreme Government of India - including Army Head-quarters - and the Government of the Punjab move from Delhi and Lahore respectively, to Simla in the Himalayas. When this move was first introduced the only way from the plains to Simla was by road. Since this was long before the days of motor-cars the tedium of the journey may readily be imagined. A railway to Simla was, therefore, proposed, and some thirty years ago the line was completed and opened to traffic. It was built by a company, but shortly after the opening it was taken over by the State. It now forms part of the North Western Railway system. 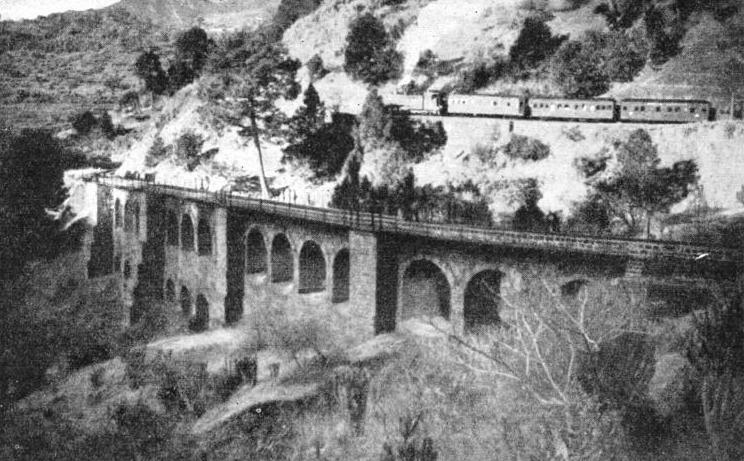 The railway runs from Kalka to Simla. Kalka, about forty miles from Ambala on the Punjab plains, stands at an elevation of 2,000 ft above sea-level. The section from Ambala to Kalka is broad gauge (5 ft 6-in), and was likewise previously owned by a company, but it has since become part of the North Western Railway. The distance from Kalka to Simla by rail is fifty-nine miles. There is a rise between these two places of roughly 5,000 ft. The climb, however, is not continuous the whole way. Over three stretches in the up direction height is lost in the form of counter grades. The aggregate length of these three sections is about eight miles. TRACK RENEWALS. In spite of the heavy rail-section on the Kalka-Simla line, re-laying has to be carried out at frequent intervals as traffic is heavy. Rail renewal is seen above in Kanoh station yard. One of the standard 2-6-2 tank engines may also be seen. The gauge of the line is 2 ft 6-in, the ruling grade is 1 in 33, and the minimum radius of the curves 110 ft. All curves of 140 ft radius and sharper are provided with check rails. The main line is now all laid with 60 lb flat-footed rails, although many sidings still exist with the old 41¼ lb rails. For the greater part of its length the line hugs steep hillsides; thus numerous retaining walls were necessary. There are no fewer than 102 tunnels on the section, with an aggregate length of five and a quarter miles; the longest is Barog Tunnel, which measures 3,752 ft. 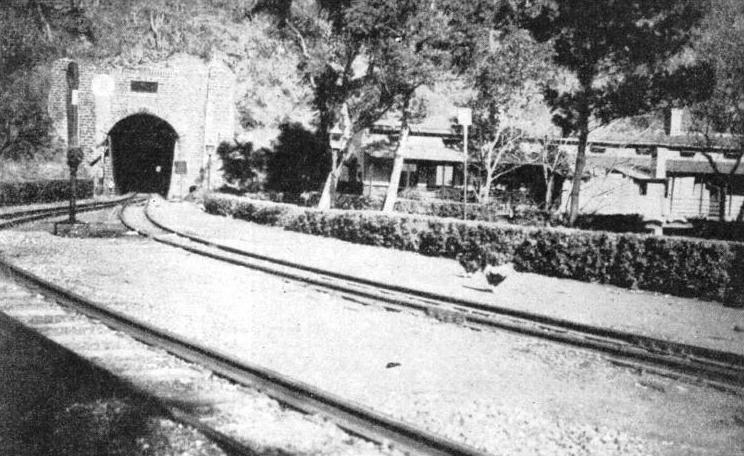 The majority of the tunnels are on curves; several are on reverse curves, notably the Gumman Tunnel on the Gumman loops. In many tunnels, especially during the rains, the leakage of water is a great trouble, causing rusted and “roaring” or corrugated rails. Galvanized trays with down pipes are fitted in many places to keep the water away from the rails and lead it into the side drains. There are few steel bridges on this railway. Since stone is available locally, small stone box culverts and arch bridges are the rule. Where the line runs to the head of a valley and then crosses to the other side, stone “galleries” have been built. These comprise tiers of arches one above the other; in some instances as many as four tiers have been used. In view of the position of each of these at the head of a valley it is necessarily built on a curve, often with a radius of 120 ft. In 1935 an arch bridge near Simla, which required rebuilding, was replaced by a steel trestle bridge. The whole of the rebuilding was done with no interruption to traffic, and yet without resort to a temporary diversion of the line. The rainy season here is from May to September, the average rainfall for the last twenty years during these months being fifty inches. This period is an anxious time, as the continual rain frequently causes heavy slips of the precipitous hillsides with consequent interruption to traffic and the ever-present possibility of a train running into a slip. During this season many extra patrolmen are engaged to ensure that any damage to the track is reported as soon as possible. There are nineteen stations on the line, each station being at the end of a block section. The longest section is four and a half miles, the shortest is one mile and a half. Each station has two running lines, and either a third loop or a relief siding. At seven of the stations water for locomotives is available, although in the dry spell of weather that precedes the rains two or three of these sometimes run short of water. The block working is by means of Neale’s token instruments; these are in the station buildings and are worked by the station-master on duty. Each station has a home signal and a starter signal in either direction; the latter can be lowered only by a key released from the token instrument when permission to proceed has been given by the station ahead. There is a large square white board beyond the home signal which acts as a distant signal, warning the driver that he is approaching a signal although it gives no indication of its position. In accordance with the usual practice on the North Western Railway there are broad whitewashed bands across the track half a mile from these boards. These serve as an additional warning to the driver at night and also in stormy or foggy weather that he is approaching a signal. The standard type of locomotive on the line is a 2-6-2 tank engine, of which there are twenty-seven. All are practically similar, twenty-three being for main-line work and four for shunting. The weight of the heaviest of these engines is 38½ tons, while the heaviest axle load is 9½ tons. The tractive force at 75 per cent boiler pressure is 14,000 lb. The coal capacity is 1¼ tons, but engines of up trains take on a few extra hundredweights at Barog, twenty-six miles from Kalka. The water capacity is 1,250 gallons. The standard load is six passenger bogies - comfortable lavatory stock - of 80 tons, up the 1 in 33 sections of line. There is no turn-table for engines at Simla, mainly because of the lack of suitable space. Loco-motives, therefore, run bunker first in a downhill direction. The driver is thus given a much better view than when travelling forward, when the water tanks tend to interfere with his vision. During the summer a service of rail motors is run. Until 1934 they were all petrol-driven vehicles, but in that summer a Diesel-electric car built by Armstrong-Whitworth was introduced. It has become popular with the public. At present rail motors in use are two four-seaters and four large Drewry cars, with seating accommodation for twelve, sixteen, and eighteen passengers. A 0-6-0 + 0-6-0 “MALLET” COMPOUND LOCOMOTIVE built to work on the Lashio and Southern Shan States branches of the Burma Railways, by the North British Locomotive Co., Ltd. Each axle carries a load of about ten tons, so that the whole sixty tons are available for adhesion; the grate area of 30 sq ft is large. The searchlight and size of the low-pressure cylinders should be noticed. 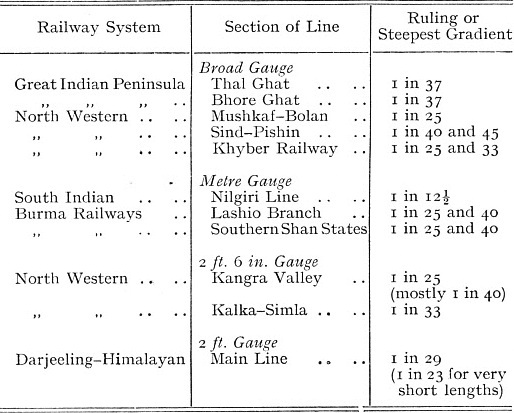 You can read more on “Burma’s Metre Gauge System”, “A Himalayan Loop Line” and “Modern Transport in India” on this website.